Left to right: Marjorie Perloff, Ludwig Wittgenstein, and Plato. Early on in her 1996 study of “Poetic Language and the Strangeness of the Ordinary,” a book entitled Wittgenstein’s Ladder, Marjorie Perloff puts forward the thesis — one which has circulated widely — that Wittgenstein wrote “‘philosophy’ as if it were ‘poetry.’” Both “philosophy” and “poetry” appear in quotation marks, giving us to understand that a certain metaphorical grammar may be at work here, although equally it may be the very literality of these terms that Perloff wishes to insist upon, in order in some sense to “undo.” In evoking this proximity of poetry to philosophy, even by way of an analogy — of an analogical writing — Perloff calls to mind, without naming, the figure (we might say spectre) of a form of “poetry” that writes as philosophy; which negates itself (as poetry) in a moment of zealous assertion of its truth (as philosophy). Perloff’s implied interlocutor here is the Plato of The Republic. In the background of Perloff’s discussion of Wittgenstein, of “poetic language,” and of “estrangement,” the three books of the Republic dealing with the exclusion of “poetry” from the ideal polis — in fact its interdiction — evoke the ambi-violence of a type of primal scene: on the one hand describing a castration-effect of language under the dominion of the philosophic Signified, and on the other describing the locus of a return of the philosophical “repressed,” its Unheimlich, its strangely resemblant yet disconcerting and innately threatening other. They rehearse in inaugurating political consciousness, towards whose “thought” — or rather rationale — language (and so-called poetic language above all) is henceforth subjectivized as “obedient, dutiful, servile, fawning” — to borrow the words of Zambian-born poet Karen Mac Cormack. Plato’s consolation to poetry is to allow it to plead, to “make her defence”: in any case, poetry is under no circumstances to speak for itself, or to speak in its own name, it must rather be represented before the tribunal of reason by others, speaking in prose — as if it were philosophy. It has gone without saying, of course, that poetry “speaking as prose,” enters upon the purview of the philosophical only by virtue of this fact, that it does not speak (just as, in the Platonic schema, the truth — under the name Socrates — remains the last word of a philosophy that does not write). But though it is prohibited from speaking in its own name, the eliding of poetry into prose, into the “language of” philosophy, evokes a type of Freudian symptomatology — a type of “return” of the philosophic repressed — by way of this seeming aporia: as if it were philosophy (or even what Badiou, addressing Wittgenstein, calls “antiphilosophie”). There is a corollary, of course, in that the “repressed” is never any detachable thing, but rather a symptom of an inaugurating gesture, such as — analogously — of the Platonic schema. The impetus of poetry’s threat to the polis is entirely apportioned in the inaugurating action of this schema (to the extent that one might indeed argue that poetry — or if not poetry in its generic sense, then poiēsis in the broader tropological sense — “is” this inaugurating action “itself”). “La poème,” writes Badiou, “signifie l’être, et enregistre l’imminence de l’acte.” In any case, poetry henceforth becomes that of which, in its own turn, philosophy will not speak — other than in the proscriptive mode or (equivalently) as an exemplum. If the republic of Plato stands as a summa of philosophical-political accomplishment, poetry then assumes something of the contrary “function” — of détournement, of ostranenie, of disconcertion and masking: which is to say, it does not state itself as thought, but enstates a type of thought (the unheimlich poetic object, so-called, puts us in the position of thinking at the same time as it maintains a critical distanciation, a “persona”). It is able to do this not because poetry may be applied “philosophically” or “politically” (i.e. as a vehicle for thought in competition with philosophy/politics), but because it itself constitutes a condition, an illicit possibility of the “philosophical” and of the “political” (Plato’s exclusion more than implies it). Words take on, in philosophy, a sense both imperious and troubling. They are at the same time made axiomatic by the effort to systematise and poeticised by the rhetorical energy of doing so. The Tractatus (an attempt, in Badiou’s estimation, to produce a work sans extérieur through an evocation of linguistic materiality: “the contrary of the entire rhetoric of Platonism”) — though concerned with articulating principles of “logic” — commences with a series of aphorisms, in the guise of axioms (replete with its own numerical pseudo-system, “un principe de montage, codé par les numerations”), about delimitation and discourse, summed up in 5.6: “The limits of my language mean the limits of my world” (Die Grenzen meiner Sprache bedeuten die Grenzen meiner Welt). It is important to understand Wittgenstein quite literally here. If Browning by way of McLuhan says “a man’s reach much exceed his grasp, else what’s a metaphor?” this “reach,” for Wittgenstein, means the possibility of language, and thus the possibility of a world — which is to say, of an idiom. The aporia of language, of poiēsis, for Wittgenstein organizes itself around an absolute alterity that is only ever able to announce itself by way of “paradoxes” that are nonetheless fully in accord with what is conceivable — as for example the type of hermetic statements we find in the films of Jean-Luc Godard, such as in Notre Musique when one of his actors proposes a two-fold definition of “death” as both “the impossibility of the possible” and “the possible of the impossible.” In both instances — Godard and Wittgenstein — paradox is not a descriptive pragmatics, but a “syntax” and a “stylistic” (“une stylistic de l’aphorisme,” e.g.). For Wittgenstein, language — whose “limits” are contiguous with those of the possible — is “everything that is the case” (proposition 1). But what “is the case” in language? Or let me return to Perloff’s formulation, from which two questions seem to want to present themselves: What does it mean to write as if? And what is poetic language? The institution of Philosophy, according to a certain tradition, is properly founded with the writings of Plato. Voilà. This idea has recently been restated by Badiou, who points to Plato’s de-suturing of “philosophy” and “poetry,” in the republic, as the foundational moment. It is a moment reflected in the birth of the Enlightenment, in the de-suturing of science and metaphysics. It suggests that, in-advance of itself, “philosophy” remained alchemically indistinguishable from the “poetic,” wrapped up in so much subjectivism. Badiou’s point hinges on the nature of the exclusion of poetry from Plato’s ideal polis — specifically the exclusion of dramatic poetry, in which the persona of the speaker is not grounded in the selfhood of poet or listener/reader, and not consequently bound by any criteria of truth (it evades the juridical, in that it disavows responsibility for its avowals) — thus permitting philosophy to constitute (or believe it constitutes) its own rule-governed class of language. At the same time, Plato’s gesture of exclusion presents itself as a type of necessity, without which philosophy would not be able to assert its claims over reason and truth, though equally the fact of poetry’s exclusion has always — however subtly, however discreditedly — represented a certain embarrassment, a certain disquietude, like the continued existence of a Britannicus in the eyes of a Nero. Ostensibly, the dramatic poet is regarded by Plato (who for his part appropriates the figure of Socrates to rail against the deleterious influence of Homer on Athenian morals) as a species of sophist, whose language presents an especial dilemma for philosophy because it is able at every stage to simulate the discourse of truth, without, as it were, being responsible for its own words. However, paradox is situational, it finds a way of inhabiting the very systems that seek to reduce or exclude it; it is produced “complementarily” with them (as anti-matter is to matter) and abolished in their abolition (as Barrett Watten says, “A paradox is eaten by the space around it”). But to return to my first question: What would it mean to write as if? One recent exploration of this question is Karen Mac Cormack’s 2008 book, Implexures — whose title refers to an archaic usage, defined by the OED as “an infolding, a fold.” Mac Cormack’s text might be loosely described as a kind of “dramatic poem” (though for the most part in prose) whose “poetics” is organized around certain constructs of persona articulated through a matrix of travelogue, letters, journal entries, diary entries, notebook entries, memoire, self-quotation, quotations from diverse sources — scientific, historiographical, philosophical, literary (including Gertrude Stein, Virginia Woolf, Robert Musil, Deleuze and Guattari, Max Beerbohm, Aphra Behn, Marcel Duchamp, and Petrarch) — newspaper clippings, civic ordinances, parliamentary records, etymologies, genealogies, trivia, photography, diagrams, dreams, mythology, political commentary, number tables, and the odd forgery (a letter, for example, from “Susan Hicks Beach,” the author’s great-aunt, “to Jacques Derrida circa 1880”): all arranged in thirty-one sections, plus postscript, plus index of “sources.” Incorporating conventions of philology, Implexures examines the functional distinctions between poetry and artefact, record, testimony, document, facticity, and ultimately what it means to speak of truth statements (Mac Cormack: “promotion to meaning enlists words”). The montage-effect of the work — the paradoxically seamless and yet inassimilable “demarcation” of the so-called poetic object — demands accounting for: firstly with regard to the logic of dichotomy (which not only underwrites whatever may be said about the “poetic” and “unpoetic,” or dramatic poetry and philosophy), but of genre and consequently of discourse as a whole; and secondly with regard to the possibility of montage, of expropriation or re-expropriation (whether of the poetic for the philosophical, for example, or of philosophy into the poetic): montage here describes a syntax, the implexure of language. From string theory to M-theory (one dimensional strings giving way to higher-dimensional membranes) but apparently “most of the known physical forces operate only within a particular (mem) brane” — except perhaps gravity. If gravity “leaks out” it might allow an inferring of a parallel “brane’s” presence. And so what’s presently referred to as “dark matter” could be ordinary matter on one of many (?) parallel branes, its emitted light “trapped in its own world” but its gravity now also in ours. How to infer the “curled up” extra dimensions of language …? is an engagement with depiction abstracted, skewed, the poetry a layering of interactions internal and external so too “on” and within linguistic forms. 1. Marjorie Perloff, Wittgenstein’s Ladder: Poetic Language and the Strangeness of the Ordinary (Chicago: University of Chicago Press, 1996), 3. In L’antiphilosophie de Wittgenstein (Paris: Nous, 2009), Alain Badiou in a similar vein describes the Tractatus as “Une saison en enfer écrit dans la forme de Un coup de dés …” (102; the comparison with Mallarmé is also made earlier, on page 88). 3. Karen Mac Cormack, Implexures (Tucson: Chax Press, 2008), 58. 4. Plato, The Republic, trans. Desmond Lee (London: Penguin, 1955), book 10, 607d-e.
5. Badiou, L’antiphilosophie de Wittgenstein, 112. 6. What this in part amounts to, is an acknowledgement that poetry is effectively excluded by Plato because it cannot be instituted, that it cannot be reduced to the type of definitional regimen he seeks to employ throughout in order to establish philosophy etc. on axiomatic foundations. In other words, that this “exclusion” is always a “pragmatique descriptive,” as Badiou says, since “by definition” poetry already writes itself out of the Platonic equation in advance, at the same time as it haunts each of its terms (philosophy defines itself, we might say, with poetry very much in mind, while poetry is only arbitrarily concerned with the philosophical as such, and this is what philosophy, to Plato’s way of thinking, cannot bear). See Badiou, L’antiphilosophie de Wittgenstein, 109. Another consequence of all this is that, despite yoking together the terms philosophy, politics and thought, Plato succeeds only in describing a type of theoretical complex, under whose rarefied conditions a philosophical “way of life” might become possible. 7. Ludwig Wittgenstein, Tractatus Logico-Philosophicus, intro. Bertram Russell, trans. C. K. Ogden (London: Routledge and Kegan Paul, 1922), 4.112. 8. Badiou, L’antiphilosophie de Wittgenstein, 99, my translation. 9. Perloff, Wittgenstein’s Ladder, 246n20. 10. Badiou, L’antiphilosophie de Wittgenstein, 98. 12. What can be thought or expressed is both inherent in language but also contingent upon a state-of-affairs of language: its poiesis, its making. Charles Bernstein, in an interview with Tom Beckett, argues: “A task of poetry is to make audible (tangible but not necessarily graspable) those dimensions of the real that cannot be heard as much as to imagine new reals that have never before existed. Perhaps this amounts to the same thing.” Bernstein, “Censers of the Unknown — Margins, Dissent, and the Poetic Horizon,” in A Poetics (Cambridge, MA: Harvard University Press, 1992), 184. 13. Badiou, L’antiphilosophie de Wittgenstein, 99. 14. Badiou, “Language, Poetry, Thought,” trans. Ray Brassier and Alberto Toscano, Theoretical Writings (London: Continuum, 2004), 239ff. 15. Poetry in this sense is the subjective in language. 16. Plato, in seeking to exclude those aspects of discourse that contradicted any systematization of language-as-reason (logos), above all paradox, was possessed by the same demon that drove Bertram Russell. The system of dialectical reduction in Plato produces the aporia of indeterminacy, just as the system of mathematical reduction in Russell produced the logical ambivalence of a whole class of sets. 17. Barrett Watten, “Plasma,” In the American Tree, ed. Ron Silliman (Orono, ME: National Poetry Foundation, 1984), 27. 18. Roland Barthes, Writing Degree Zero, trans. Annette Lavers and Colin Smith (New York: Hill and Wang, 1967), xv. 19. Mahmoud Darwish in the film Notre Musique, dir. Jean-Luc Godard (2005). 20. Mac Cormack, Implexures, 14. 23. Badiou, L’antiphilosophie de Wittgenstein, 100. 24. Mac Cormack, Implexures, 88. 26. Bernstein, A Poetics, 152. 27. Jacques Derrida, Writing and Difference, trans. Alan Bass (London: Routledge, 1978), 62. 28. On this collocation, see Martin Heidegger, “The Question Concerning Technology,” in Basic Writings: From Being and Time (1927) to The Task of Thinking (1964), ed. David Farrell Krell. Revised edition. (London: Routledge, 1993), 308. Photo by Sandro Arcais, via Wikimedia Commons. What is a pebble? Is it an object or a thing? A weapon or a tool? Is it naïve or is it sentimental? Is it a token of the real, or a fragment of ideology? Can you do more than skip it or hurl it or mark a grave with it? What is the pebble to poetry? Of what might the poem make it speak? 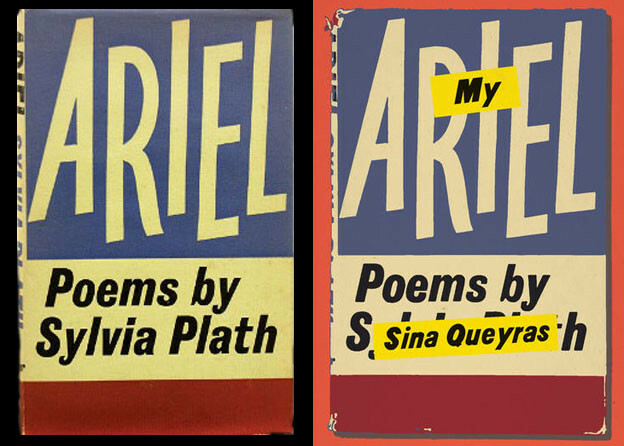 In the first poem of Sina Queyras’s poetry collection My Ariel, an I-speaker testifies that “A love procedure set me going like a big fat lie.” This line directly overwrites one of Plath’s most famous lines — “Love set you going like a fat gold watch” — often quoted to portray Sylvia’s personal experience of new motherhood on the occasion of her daughter Frieda’s birth. We maintain the complete archive of Jacket magazine, founded and edited by John Tranter.